Antigua's Raisin Bun is often referred to as Bun and Cheese because it is eaten with cheese. It's a favorite among locals and well as tourists. 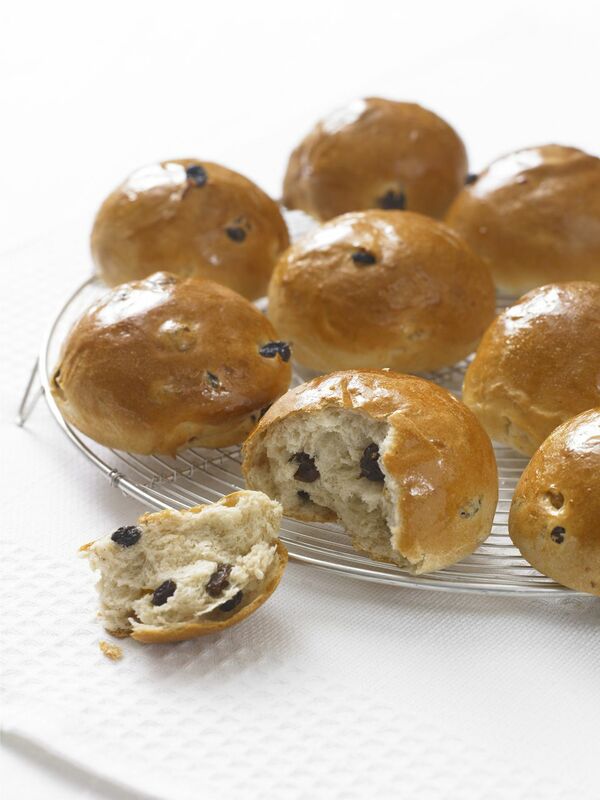 If you like Raisin Bread, you will love these Raisin Buns. Add 2 teaspoon of sugar and 1/2 cup warm water to a large bowl and stir to dissolve. Sprinkle in yeast, stir, cover with plastic wrap and let proof in warm place for 10 minutes. Add 5 1/2 cups of flour to a large bowl along with the salt, cinnamon and nutmeg. Mix thoroughly. Rub in shortening and butter. Stir in sugar, coconut (if using) and raisins. Make a well in the center of the flour mixture and pour in yeast and essence. Add the remaining water 1/2 cup at a time to form a slightly sticky dough. (You may need more or less water depending on your location and the moisture in the atmosphere). Once the flour comes together as a dough, sprinkle the remaining 1/2 cup flour onto a clean work surface, turn the dough onto the work surface and gently knead the flour into the dough (for about 5 minutes). You may need to add a little more flour for dusting. Rub oil on the dough and transfer to a large oiled bowl, cover and leave in a warm place for 1 1/2 to 2 hours or until the dough has doubled in size. Flour a work surface and transfer the risen dough. Knead for 1 minutes then cut dough into 12 equal pieces and form in balls. Place seam-side down on parchment-lined baking sheets with adequate space between each bun. Cover with plastic wrap or towel and let buns rise in a warm place for 45 minutes to 1 hour. Meanwhile preheat oven to 350 degrees F (start preheating 25 minutes after the dough has been resting). Brush buns with water, sprinkle with sugar and bake for 20 - 25 minutes or until nicely browned. The bottom when rapped should sound hollow. You can opt to score the buns just before adding it to the oven. What Is Cassava and How Do You Make Farine?